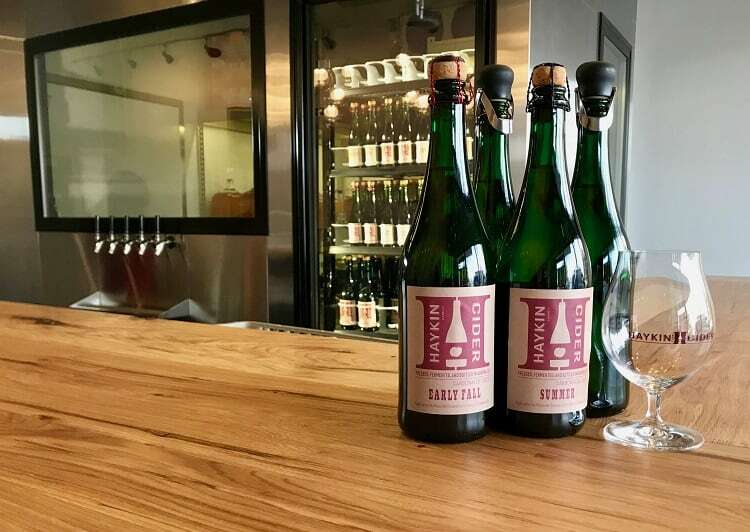 Talia and Daniel Haykin opened the Haykin Family Cider tasting room in Aurora, Co. (about 12 miles west of Denver) on February 1 of this year. When it comes to making cider, these two aren’t messing around; their majority single varietals, with no adjuncts or added sugars, have nabbed a bunch of prestigious awards and developed a steady following. 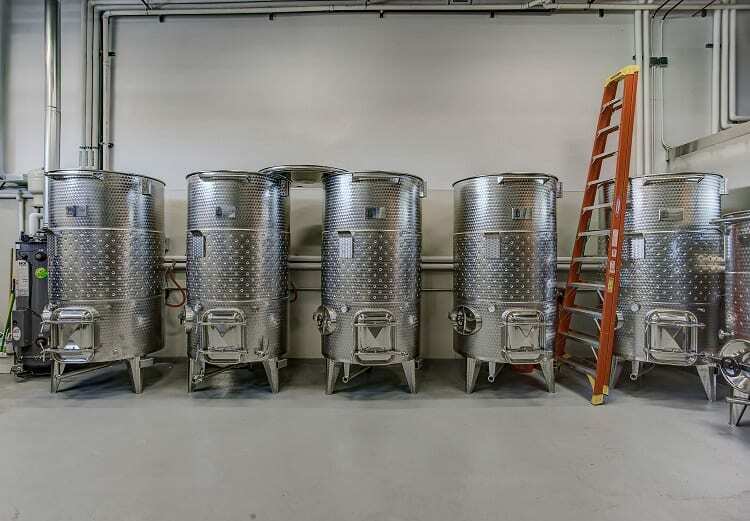 When it came time to designing a space to produce the ciders in and welcome in guests, the Haykins’ goals were balanced between affordability, spatial needs, and comfort for patrons to enjoy their visits. Due to square footage constraints, they couldn’t fit traditional press equipment, and so they developed unique alternatives. Most of the equipment, including a huge fruit press from Italy, are on casters. “That’s the only way we could make it all work. We call ourselves a ‘winery on wheels,'” Talia adds. Some smaller batches are still made in glass carboys in a custom-built cooler. To highlight the beauty of the carboys, they built the bar around the cooler and installed heated windows so that patrons can watch the whole process. “This idea has become the center of focus in the room and something people regularly comment on and photograph,” she notes. 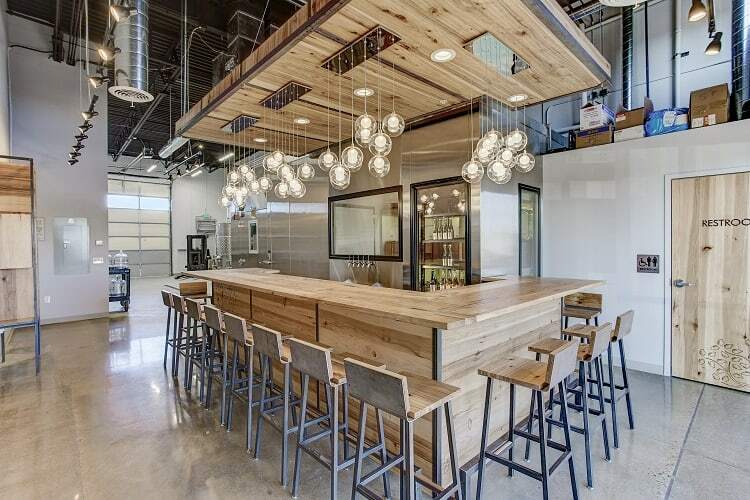 The aesthetic of the space also balances the look of a production facility (stainless steel) with the warm, organic feel of a tasting room. To offset the cold, clean look of stainless, the Haykins chose a hickory wood with lots of knots, prominent grain and a lower-gloss finish. “So people don’t feel like they are drinking in a warehouse, we built a ‘cloud’ (false ceiling) above the bar for a more enclosed feel. The bar, cloud, stools and several pieces of decor were built by Fin Art, a local company. They are incredibly gifted metal smiths and woodworkers, we were so lucky to work with them,” Talia says. 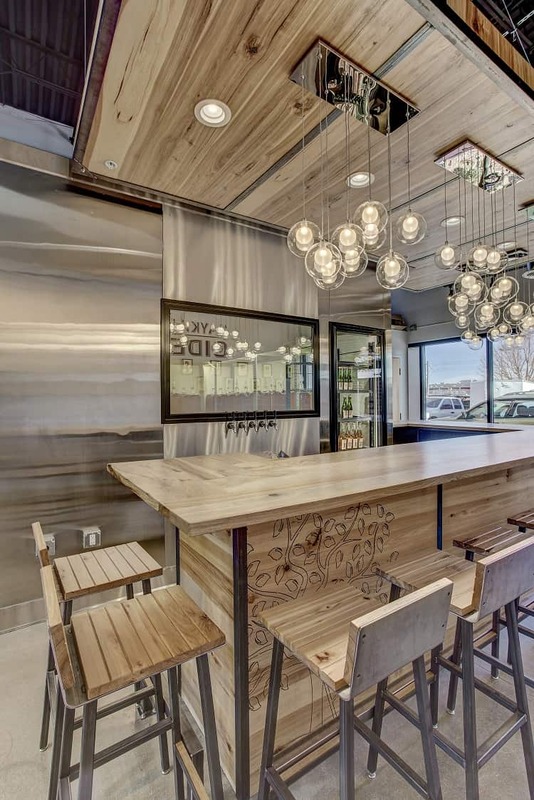 The glass light fixtures were chosen because they’re reminiscent of bubbles rising in a glass, “which mimics our effervescent cider,” Talia notes. As fans of Eric Lewandowski from heirloomapple.com, they used his original artwork and prints to decorate. Though the tasting room has a mellow, relaxed aesthetic, there were hardships along the way to opening. In addition to the complexities of finding the right space, there have been some hitches in production, as well. 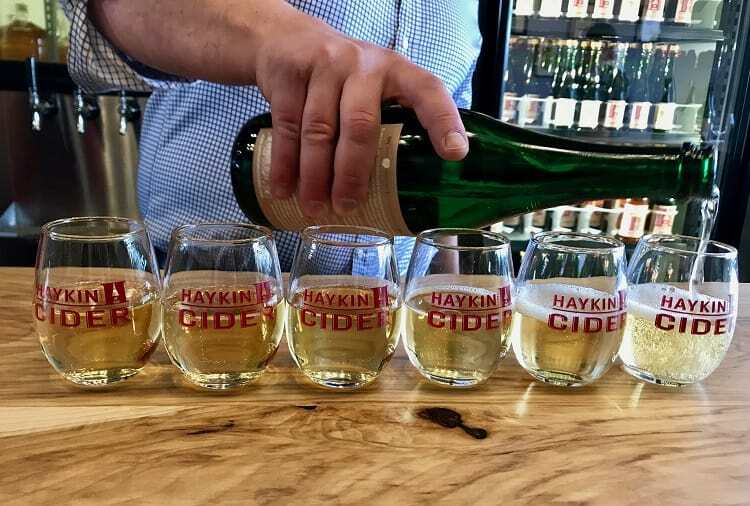 Haykin Family Cider is made with apples sourced from Colorado growers, who Talia reports had “a devastating late frost last year.” This curtailed their production goals for this year. “We love our local fruit, and this was an especially difficult blow,” she says. “Additionally, our equipment was stuck in the port of Houston during Hurricane Harvey and we had our first batch of labels stuck in a factory in Napa during their devastating fires.” Pair those setbacks with construction delays and issues with vendors and contractors, and you’ve got a situation that could feel overwhelming to anyone. But, on top of all that, Talia was pregnant for most of the construction process and opening and gave birth six days after opening the tasting room to the public. But, the persistence has paid off. They’ve been able to make their ciders in small batches, with a focus on experimenting with single varietals. The 2016 Esopus Spitzenberg, which won first in class in Modern Sweet at GLINTCAP, is one they are particularly proud of. At the urging of friends and family, the Haykins began to enter their DIY ciders to competitions, and their submissions performed well. After winning first in class at GLINTCAP and best of show at Franklin County CiderDays, they gained the confidence to start a small commercial operation. “At this point, we are thrilled running a small craft operation and don’t have any plans to get significantly bigger,” Talia says. 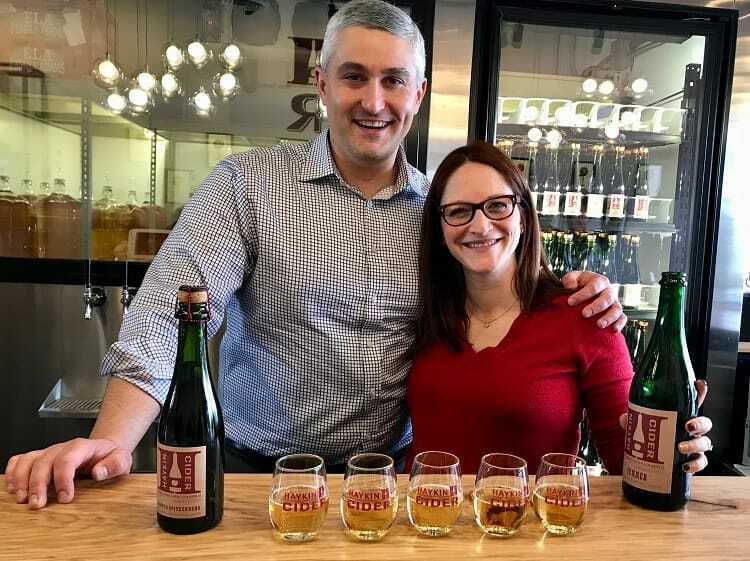 Though Haykin Family Ciders is a big focus for the couple, Daniel continues to work as an investment adviser and Talia consults for a few marketing clients. 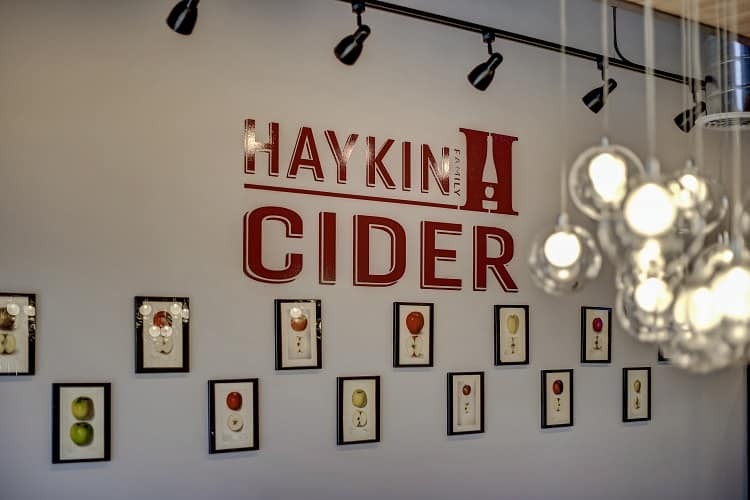 Find Haykin Family Cider‘s tasting room at 12001 E. 33rd Ave., Unit D in Aurora, Colorado; phone: (720) 242-7292.